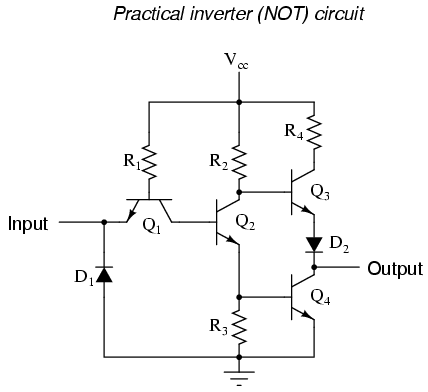 now i learn robotic and electro... when i read articel about transistor they say transistor can connect each other and somehow become "Logic gate" i already search in internet but i cannot find the answer... can you help me?? please explain to me how transistor can become "logic gate"
Who really invented the transistor? Artificial intelligence by reading electron energy states? i already found the answer Transistor Gates well... somehow they make transistor into fast switch, and from that we can make logic gate... >_< did anyone already make it?? can you show me example?? You can easily take the not gate as an example every input i.s inverted. i am told this is +5v for 1 and 0v for0. So the output i want is 0 when i input a 1. The not gate acts as a switch if input is 0 current can flow through q1 but not q2 therefore current can flow through q3 and a 1 is output. If input is 1 q1 and q2 are on and q3 is off so current flows to earth giving you a 0. Maybe you could try multimedia logic it allows you to use or, not and AND gates to make circuits like a full adder etc. Last edited by fiveworlds; November 13th, 2012 at 08:12 PM. You have many examples in front of you right now. Your computer chips contain hundreds of thousands of these. i also read that, an microcontroler create my combine many mini eletronic componen and create an algoritm, but i still dont understand how they actualy work..
hmm i want you all give me an opinion, from where i need to start an electronic project, so iam can learn electronic from basic to top, since iam not in electronic major. this far study, i am already try "flip flop lamp", hmm so what project i need to do next?? You could try making circuits using memory or designing circuits based on an algorithm try something easy like am i able to make a cup of tea? Then make a truth table out of your possible inputs, k=1 if i have a kettle, t=1 if i have a teabag, s=1 if i have sugar and so on. Try to eliminate this down to the smallest amount of gates possible by examining your circuit and asking wether i can make a circuit without taking into account certain gates ie. i can make a cup of tea if i do not have sugar etc. They don't create an algorithm, they implement one that you (or someone else) creates. As you will see from reading those pages, an algorithm is essentially a procedure for carrying out some operation. Digital circuits (logic gates connected together in the right way) implement the steps outlined in the procedure. So step 1 is to come up with the algorithm, and step 2 is to implement it with the digital circuits. Transistors are basically switches, they control signals. You first need to learn how transistors work; their switching modes and circuit configurations. Once you understand how they can be used as switches, then you can move on to reading on how they can make different logic gates. Last edited by merkezci; March 15th, 2013 at 10:58 AM. Transistors are just what help make the gates they also consist of other components like diodes but, gates are tiny digital circuits that accept one or more data bits as inputs and produce a single output bit whose value (1 or 0) is based on a specific rule”. Transistors are just what help make the gates, they also consist of other components like diodes. gates are tiny digital circuits that accept one or more data bits as inputs and produce a single output bit whose value (1 or 0) is based on a specific rule”.